WASHINGTON—In an effort to streamline the process for qualifying travelers, officials from the Transportation Security Administration introduced a new precheck program Thursday that provides expedited interrogations for Muslim passengers. “Whenever I fly, there’s always a long wait in line before I get pulled aside for a security check and ushered into a back room where I’m grilled about my identity and background; but for just $120 and a short appointment, all of that waiting is removed, and I can skip straight to being questioned at length by law enforcement,” said Akron, OH resident Asma Soubra, who, along with other accepted applicants in the program, will be allowed to bypass other passengers and proceed immediately to a small, windowless interrogation room in the airport where officers will take turns attempting to pin extremist sympathies onto her. “I used to have to get to the airport so early to make sure I could get through the line and then all the intrusive searches of my belongings and the inquiries about my travel plans, religious values, and political beliefs. 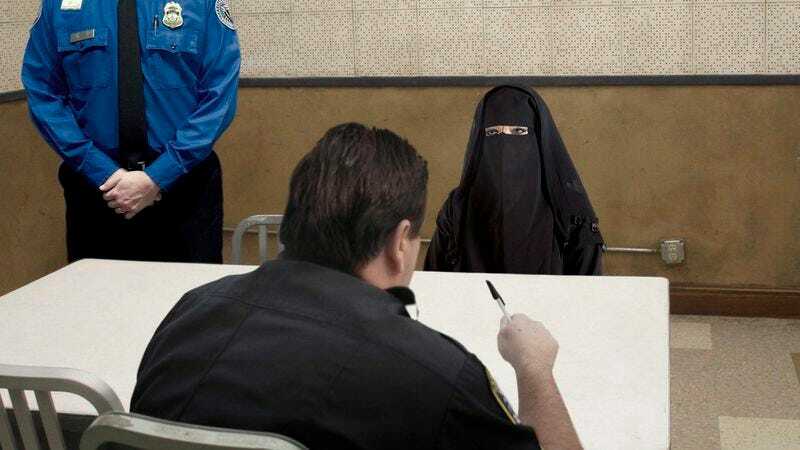 Now, I just show up four hours before my flight, jump ahead of everyone else, go right into the holding cell for a few hours of invasive examination, and then I’m on my way.” TSA officials also confirmed they were planning to offer the expedited interrogations to non-Muslim travelers who simply look like they are from the Middle East.